The Atlanta Hawks were one of the best stories and teams from the 2014-15 NBA regular season, winning 60 games and claiming the top seed in the Eastern Conference by seven games. The Hawks sent four players to the 2015 NBA All-Star game and their coach Mike Budenholzer was deservedly named Coach of the Year. The Hawks were the definition of team basketball, with players always making the right basketball play and not caring who ultimately scored. This team seemed to be onto something, as each member of the team had a role they were happy to fill. As we are quickly learning the Hawks may be best described as a house of cards (great analogy Zach Lowe/Amin Ellhasan) in the sense that if one of their pieces goes missing the entire thing crumbles. It was bad enough when Atlanta entered the playoffs without reserve Thabo Sefolosha who underwent season-ending surgery in April for a fractured tibia after a police altercation. 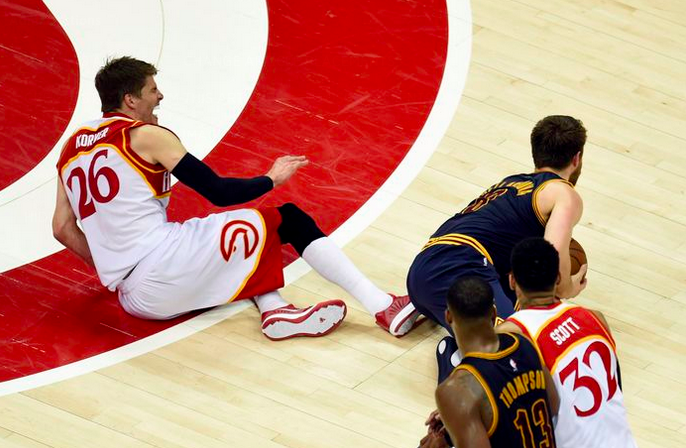 The Hawks also saw “center” Al Horford leave Game 2 with a knee injury and not return. He is considered day-to-day and will probably decide if he is going to play right before tip off of Game 3. Add both of these injuries to an already hobbled DeMarre Carroll, and that house of cards I was talking about is as close to falling down as its ever been. For Hawks fans the worry should extend much farther than just losing the series the Cavaliers. Atlanta has a new ownership group and will enter the 2015 offseason with many more question marks that it was going to have. These injuries only muddy the water even more for a team that is on the verge of becoming a championship contender for the foreseeable future. Forwards Paul Millsap and DeMarre Carroll are unrestricted free agents and join Elton Brand and Pero Antic as four players Hawks management will have to make a decision about this summer. As if these decisions would not be tough enough in a vacuum, now let’s add in the recent injuries. Had the Hawks stayed healthy throughout the playoffs management would have had a better idea just how close this core of guys was to winning a championship. Now no one will ever know and depending on what happens this offseason no one may get the chance to know for sure. Carroll has gone on record saying he would consider other teams this summer, such as the Knicks and Lakers, and he should. Carroll was drafted late in the first round of the 2009 Draft and has played for five teams in that six year span (meaning he has never really gotten paid). Of course Carroll wants to explore his options financially. This does not mean he will definitely leave Atlanta, but things can change quickly in free agency when teams like the Knicks and Lakers will be desperate to over pay free agents. Millsap signed a shorter, two year contract back in 2013 after spending his first seven seasons in the league with the Utah Jazz. He basically bet on himself that he could play his way into more money and it appears that is what is going to happen. The question becomes will Atlanta be the team signing his checks next season. The injuries the Hawks have faced make this upcoming summer that much more interesting. Management will have to decide if they want to pay to keep this core of guys together for the next couple of season. This decision will be a tough call to make, especially now because the recent injuries have prevented those same decision makers from seeing this team’s full potential. It’s important to keep in mind the Hawks do play in the weaker of the two conferences, and has not looked as dominant in the first two round of the Eastern Conference Playoffs as teams have had time to prepare for their tendencies. Had the Hawks stayed healthy would management have decided to bring everyone back, or would they have been able to see that this current team does not have what it takes to be a legitimate championship contender? Will management run this team back and sign both Carroll and Millsap? Sure the cap is expected to make a huge jump next summer when the new television deal kicks in, but at that point the Hawks will have their core already under contract except for Horford. One glimmer of hope is the Hawks do have the 15 pick in this year’s NBA draft thanks to the Joe Johnson trade back in 2012. And to think Hawks fans were booing Johnson every time he touched the ball in the first round series between Atlanta and Brooklyn. Heck, the Johnson trade might ultimately be the thing that pushes the Hawks team over the top in the next few seasons. Major franchise decisions are on the horizon for the Hawks and are rapidly approaching as their current team tries to comeback from a 0-2 deficit against the best player on the planet. The 60-win Hawks came out of no where this season to make the Eastern Conference Finals, but is this the ceiling for this group of guys? Unfortunately the injuries to Korver, Carroll and Horford make that an impossible question to answer right now. This entry was posted in Draft / Offseason, Home, NBA, Playoffs / The Finals and tagged 2015 NBA Draft, 2015 NBA Offseason, Al Horford, Atlanta Hawks, Brooklyn Nets, Cleveland Cavaliers, DaMarre Carroll, free agency, Kyle Korver, Mike Budenholzer, Paul Millsap, Thabo Sefolosha. Bookmark the permalink.